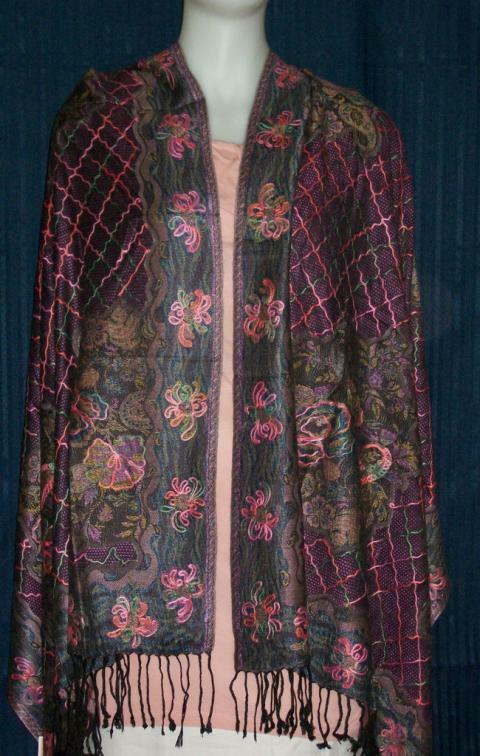 This stylish woolen floral print shawl is colorful and elegant. 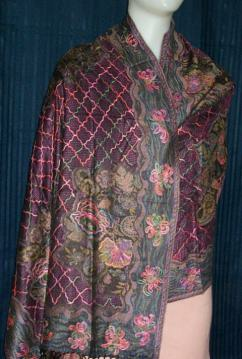 It is accented intricate embroidery. An ideal winter wear that can go with traditional dress or western outfits. Great for everyday usage, evening parties, wedding or as a unique special gift. Size Width: 28" Length: 80"
This item in Winter Wear & Shawls category was first added to our catalog on 12-03-2014. Buy Black, Purple & Pink Wooven Embroidered Shawl, sold & shipped by Shieno Boutique where you can shop online for Latest Sarees, Salwar Kameez, Shawls, Jewelry & Clutches. This Shawls collection has been tagged as Warm Winter Woolen Odhni, Holiday Gift Set, Long Wrap, Unique Dupatta, Traditional Stole, Woolen Clothes.